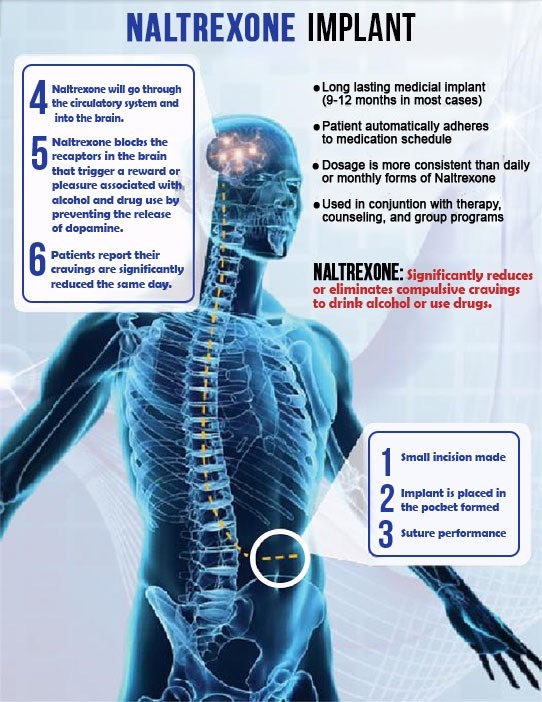 Naltrexone is an FDA approved prescription medicine that not only reduces or eliminates any desire for alcohol and drugs, but effectively blocks their effects as well. Can be very effective for: alcohol, heroin and all opioid drugs including Vicodin®, Oxycodone, Oxycontin, Hydrocodone, Methadone, Suboxone and many other prescription pain medications. It has shown to help significantly improve the success rate for alcohol and addiction recovery. In 1984, the FDA approved an oral pill of this drug for chronic opioid addiction, and in 1993 for alcohol addiction. This form of treatment has not been very effective however, because patients need to take the drug on a daily basis in order for it to block the opioid effects. In fact, oral Naltrexone has a 90% failure rate. Patients who have not yet developed the essential coping skills are at an extreme high risk for relapse. Relapse can easily occur because they can stop taking the medication (or forget) and turn to drugs whenever circumstances or events trigger a stress response that the addict feels they can’t handle. Naltrexone is also available in a monthly injection as a prescription drug called Vivitrol®. The monthly injection eliminates the problem of daily dosing, but can be very painful with the large needle and intramuscular injection, can cause an abscess, requires frequent doctor visits and has a high failure rate as well. Add in the monthly ups and downs of the treatment, and well… This is a better option than the oral dose, but the monthly expense, scheduling, significant discomfort (large needle) during the intramuscular shot, as well as the short duration of effectiveness make it less than ideal as a treatment option, and with a high failure rate similar to that of oral dosing. A more recent option (and the one with the greatest potential for success) for delivering Naltrexone is an extended release pellet placed under the skin. This option offers the best duration of benefits with a lower cost per month for the recovering alcoholic or addict. While Naltrexone is being slowly released into the body, the sustained level of medication blocks the effects of alcohol and opioids so it is virtually impossible to relapse, and it allows a mind to be free and clear for recovery without the ravaging obsessions to use and drink. Just as importantly, it eliminates the need to take pills or injections, thus removing the crucial ‘compliance’ factor. What many find extremely beneficial, too is the constant 24/7 delivery of the medicine eliminates the highs and lows (a major cause of relapse) from any other method of administration. Eliminating the variables for relapse is of crucial importance, hence the pellet implant’s effectiveness. Based on our experience, yes. FDA-approved pharmacists manufacture the implant containing FDA-approved Naltrexone for each individual patient in FDA-approved facilities while maintaining the highest pharmaceutical quality standards. The Naltrexone 100% biodegradable pellets themselves have not yet been cleared by the FDA. but Naltrexone itself had been FDA-approved for over 30 years. Initial studies suggested that, in rare cases, it could cause additional liver problems in patients with acute liver disease such as hepatitis, but in practice it has been extremely well tolerated by most patients. Patients receiving the pellets obviously can expect slight bruising and discomfort for a short time after the simple outpatient procedure. There is also a very small risk of post procedure infection but this has not occurred in any of our patients. 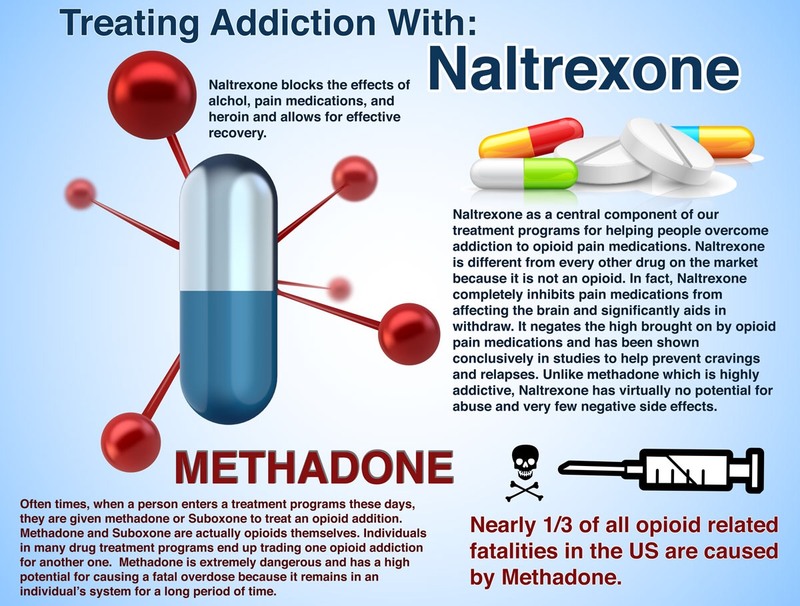 If a Naltrexone program is started before the patient has significantly detoxed from the opioids, the pellet will cause severe opioid withdrawal symptoms. Worth noting, is if a patient on naltrexone therapy were in an accident where narcotic medicines are normally used for pain relief, the narcotics would have no effect. Should the patient be injured after the procedure and require analgesia (pain medications), they must inform the doctor that he is on naltrexone maintenance therapy so an alternative medication may be prescribed. Because the patient may be involved in an accident or some other occurrence that renders him unable to inform the doctor that he is on the medication, it is recommended that they wear a Medic-Alert tag which advises the doctor that the patient is receiving naltrexone maintenance therapy. If patients try to override the blocking effects of naltrexone and abuse narcotics they have a very unpredictable and dangerous risk of a fatal overdose. Patients also need to be especially careful after the implant wears off because they no longer have a tolerance for the drug. The same amount of drug previously used after a period of abstinence can be fatal. How Does Naltrexone compare with Opioid Maintenance Therapy (OMT) Drugs such as Methadone, Suboxone®, and Subutex®? Unlike these drugs, naltrexone does not have an ‘opioid effect’ or produce any sort of high; it is non-narcotic, non-addictive and non-mood altering. Because of this fact, naltrexone is allowed in most treatment recovery programs and in sober living homes. In addition, once a person is on naltrexone, they cannot get high from opioid use and they can stop without any withdrawal symptoms. Although OMT drugs can be useful in short-term detox programs, they should not be continued for an extended period. This reduces the potential medical addiction to these prescription drugs that become just as difficult, if not more, to quit as heroin or pain medications. Remember, too, these medications typically have major withdrawal symptoms of their own, as well as requiring a full detox program. Is a Naltrexone Implant a Cure to Opioid or Heroin Addiction? In a word: no. We believe strongly that naltrexone pellet therapy by itself is not a cure, but during the period of its opioid blocking effects it virtually eliminates the possibility of relapse. This is the key for many addicts that want to recover but believe it is impossible when they are dealing with the daily cravings. Freedom from the cravings, and knowing there is no reward of getting high, allows the recovering addict who is 100% committed to recovery to put all of their mental focus on professional, expert therapy. Further, studies have shown that the best indicator of long-term recovery is continued participation in a peer recovery program such as a 12 step, SMART or CELEBRATE. Most addicts have not developed the life skills and behaviors required for lifelong sobriety. This is the real work in addiction recovery and one that cannot be ignored or assumed to take care of itself while enjoying the freedom from cravings. Naltrexone therapy without the appropriate therapy and Peer Support program is almost always unsuccessful. The ultimate goal of recovery from alcoholism is genuine, real, true freedom. How do we do this? By learning how to live a happy, prosperous and fulfilling life without drinking. There are also a number of medicines that can assist in achieving and maintaining abstinence. Naltrexone is probably the most powerful of these medicines. Naltrexone is a drug that attaches to the opiate receptors in the brain and blocks them. Part of the pleasurable effect from alcohol happens through these opiate receptors. When these receptors are blocked, people get fewer cravings for alcohol and less pleasure if they do drink any alcohol. It becomes much easier for them to stay abstinent and continue with their recovery program. How Long Should I Stay on Naltrexone Therapy? We believe strongly that patients should be on naltrexone pellet therapy for a minimum of 6 to 12 months for the best chances of a lasting recovery. This essentially prevents them from relapsing back to alcohol or narcotic use and gives them at least a year to start making changes in their lives and working in a support group. Patients that decide they want to continue with the naltrexone therapy can receive additional pellets or transition to daily oral naltrexone medication. There are no long-term complications or side effects from the low dose naltrexone therapy. In fact, low dose naltrexone therapy has been found to actually strengthen and improve the immune system, and has been used successfully in illnesses such as cancer, arthritis, chronic fatigue, fibromyalgia, and MS.
Am I a candidate for a Naltrexone Implant Program? Naltrexone would be appropriate for any alcoholic or opiate addict who desperately wants to stop but has never managed to stay sober for a long period. The term we use to best describe this person is that they are in a “state of readiness”. A person may say they are ready to recover, however this will only be confirmed through their actions that will be obvious to their peer recovery group, their therapist, their family and friends, etc. The recovering alcoholic/addict will consistently make life-affirming changes that demonstrate self-reliance and emotional maturity. Naltrexone is very helpful for those that are ready but know that relying on will power or counseling alone will not work for them. Naltrexone is NOT a narcotic or mood-altering drug and is therefore not objectionable to most recovery programs or sober living homes that require abstinence. Along with our 1:1 Counseling and Peer Recovery Support Specialists network, participation in a 12-step recovery program or similar is a primary, crucial form of follow-up care. We believe there is no substitute for the therapeutic value of one alcoholic or addict helping another to sobriety. What’s the process of evaluation and treatment with Naltrexone pellet therapy? A person needs to be free from alcohol, opiates or heroin for a minimum of one week before receiving a naltrexone pellet. Those on Methadone, Suboxone® or Subutex® should be off their prescription for at least 10-14 days because these drugs take longer to clear from the body. Even if no opioids have been taken for the recommended time, there may be some mild to moderate withdrawals due to the chronic imbalance in the essential brain neurotransmitters. We require a simple blood test, a basic screening and exam to decrease the risks and increase the success of Naltrexone therapy. We will also perform a urine drug screen immediately prior to the pellet insertion. The procedure is simple and takes just a few minutes to perform. The doctor will numb the area and then make a small incision and place one pellet under the skin. The incision is closed with a few stitches and the patient is sent home or could even go back to work if they desire. It is recommended that patients wear a Medic-Alert tag (bracelet or necklace) that would inform a treating physician that the patient is on naltrexone maintenance therapy in the event that the patient is not able to communicate this information. The physician would obviously need to prescribe a non-opiate medication if pain relief was required. There are very few side effects from naltrexone and none of them are serious. It is difficult to determine whether the symptoms that are sometimes experienced are due to the naltrexone or the last remnants of the withdrawal syndrome. The withdrawal symptoms do not occur with every patient, especially if the addict has not used drugs for an extended period. Even if the patient experiences some withdrawal symptoms, they are generally mild compared to acute withdrawals experienced during drug detox, and cease within a week or so. Are follow up appointments necessary? ​Approximately one week after the procedure, patients may return to the clinic to have the stitches removed. Our single pellet lasts approximately 6 months, the duration of effectiveness varies with each individual. Why do we use Naltrexone? What form of Naltrexone do you use? The innovative, non-addictive Naltrexone 6 month mini-pellet implant manufactured by BioCorRx (why BioCorRx?). Naltrexone works very well as a tool for helping those committed to recovery. Don’t take our word for it, there are decades of research from around the globe confirming its effectiveness as an anti-craving medication, and when combined with a comprehensive treatment program such as the one we offer, it can be one of the most powerful tools for recovery available anywhere in the world. In addition to your own research which we highly recommend, please visit our Research and Testimonial section for a start.